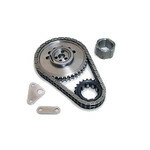 This double roller high performance timing chain kit is a perfect complement to your high performance valve springs and other LS- Gen III/IV engine components. It offers greatly enhanced strength and accuracy compared with the stock piece and even allows for timing adjustments (advance or retard) of up to 8 degrees. The set contains an adjustable nine keyway billet steel crankshaft sprocket with a Torrington thrust bearing, two oil-pump spacer plates, and detailed instructions. Fully machined billet steel sprockets. Roller Chain designed with .250" diameter rollers. Adjustable to 0, +/-2, +/-4, +/-6, +/-8 degrees. Machined for and include Torrington thrust bearing. Designed for an aftermarket 3 bolt camshaft. NOTE: LS3 OEM Center-to-Center length.